These beige plastic cigarette receptacles are made of sturdy polyethylene that resists dents and scratches. The stands make great indoor and outdoor ashtrays and will reduce litter wherever they are placed. 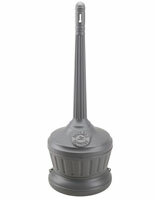 These plastic cigarette receptacles are of the Smokers' Outpost® brand and have a reputation for safely extinguishing butts. The indoor-outdoor ashtrays do not require sand or water, as they restrict airflow to safely prevent fires. 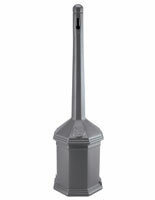 Cigarette receptacles like these will help reduce litter in entrances, parking lots and other public places. 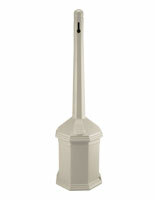 The Smokers' Outposts are also available with a gray or black finish.